Traveling to California this past weekend, Cinecultist had to forgo our usual multiple visits to the cineplex in favor of tromping through the gorgeous wilds of east Sonoma in highly inappropriate footwear. (You can take the CC out of Manhattan, but you can't take the high heels off her pedicured feet. Or something like that.) However! Who needs to go to films, when a real live movie star runs your state government? 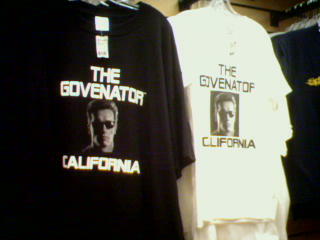 Despite our misgivings, it appears that Californians love their Governator, as we found his swag conveniently for sale in the Oakland airport magazine and snacks shop. In her article in last week's New Yorker (available in print version only), Connie Bruck writes of the "Supermoderate!" that "Schwarzenegger has combined marketing savvy and elaborate Hollywood staging to bombard Californians with this message: he is their action governor, just as he was an action hero�and together they will do the impossible!" The deliberate blurring of image and reality is intriguing, no?